The 52 in. Brushed Nickel Palermo ceiling fan from Hunter exhibits rich and contemporary styling that will blend seamlessly into your decor. 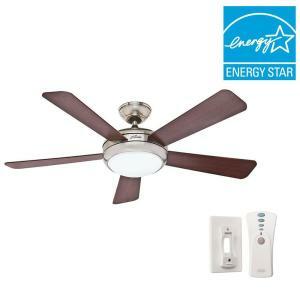 This Energy Star rated fan includes 5 reversible Cherry/Maple blades, an integrated 26-Watt light fixture and a remote control for easy operation from the palm of your hand. It is designed to install easily with 3 different mounting options and perform beautifully for years to come with an ultra powerful Whisper Wind motor. Tbook.com crawls the web to find the best prices and availability on Hunter Fanss and related Tools and Hardware products like Hunter Palermo 52 inch Indoor Brushed Nickel Ceiling Fan with Remote. For this page, related items include products we find that match the following keywords: "Hunter Fan" at our vendor partner Home Depot. Hunter Palermo 52 inch Indoor Brushed Nickel Ceiling Fan with Remote is one of 151 Hunter Fanss and related products listed in the Tools and Hardware section of Tbook.com If you have any questions on this product, please give us a call at 734-971-1210 during the hours of 9am - 5pm EST for assistance. Thank you for shopping at Tbook.com, the Internet Department Store!